Dowling Real Estate – Tips For Designing A New Kitchen! Tips For Designing A New Kitchen! Here are five key layout considerations to take into account when designing a new kitchen. The lifestyle you lead should inform the kitchen design. If you love to entertain and see cooking as a social occasion, you may want to consider a cooktop on your island bench. Equally, you may want to hide your sink on the back bench or have a second one in a butler’s pantry to keep messy plates out of sight. Think carefully about how people may use the space. Think about how many people might be using the kitchen at the same time and make sure there’s enough floor space. White kitchens remain popular in Australia however, colour is making a comeback. The right colour choice can make a big difference. Kitchen cabinets can be made to match almost any paint colour and the right tone will really improve the look and feel of this space. Kitchen cabinetry and benchtops need to be cut to accommodate appliances, so don’t forget to take these key items into account. Did you know you some microwaves also act as steamers? Have you seen those warming drawers that keep plates warm? What about fridge drawers?Appliances will have an impact on things like cabinetry, so make sure to plan appropriately. With so many new appliances on the market, shop around and find what works for you before finalising the design. Consider integrating appliances by hiding these tools behind cabinets for a seamless look. Engineered stone, commonly known as Caesarstone, has come a long way. It is now near impossible to tell the difference between faux-marble and the real thing. Choosing your stone is just the start. You also need to consider the thickness of this element, with the standard being 20mm although 40mm is popular too. Anything over 40mm will certainly make a statement. Remember, you can run stone up the splashback wall too. 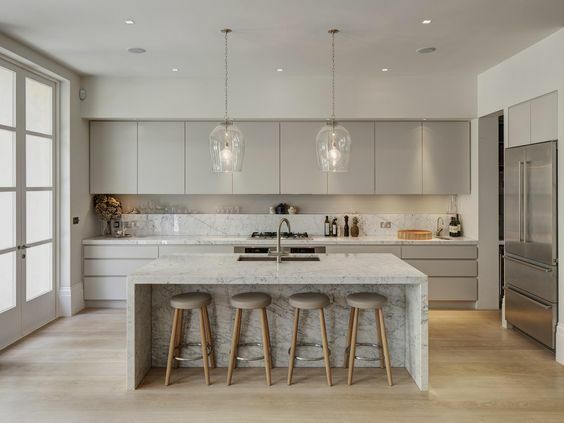 Most kitchens have either an island or section of the bench that sticks out and it is here that pendant lighting can stand out for the right reasons. Look for lights that complement the handles on your cabinetry or the tapware. Pendant lighting can be effective in a modern kitchen. Pendants don’t need to be expensive. In fact, you can pick up some gorgeous ones at your local hardware store for less than $100.